Need more information about booking Home 7253498 ? A cute lovely ground floor studio apartment located on Rozenstraat right in the heart of the city close to Anne Frank house, Jordaan area and Dam Square. A great studio offering a private entrance and your own private patio which is lovely on the sunny Amsterdam days. 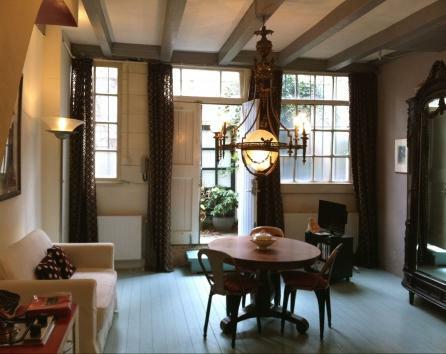 Located just off the Princengracht canal on Rozenstraat right in the heart of the city close to Anne Frank house, Jordaan area and Dam Square. The apartment is on a quiet street, but only 2 minutes walk away from the bustling Rozengracht, where you'll find cafes, bars and shops. THE NINE STREETS, with loads of designer boutiques, art galleries, and quirky little shops you won't find on the hight street, are a short hop away. The living area comes with sofa, table and chairs, comfortable sofa, TV and DVD. Large double bed and extra sofa bed for a child. The fully tiled bathroom has shower, toilet and hand basin. Small kitchenette suitable for cooking small meals and snacks, comes with microwave kettle, refrigerator, coffee machine and other items. NO oven or dishwasher. NO laundry facilities in the apartment but there is a laundrette on the corner of the block. There is a small sofa bed suitable only for a child 4 or under. One child can be accommodated on the sofa bed with a surcharge of 10 euro. You can get in touch with Alice and Team (the owner) through the contact form on this page. Send Alice and Team (the owner) an email through the contact form on this page. Alternatively, if there’s a phone number on this page, you can call them. How do I contact Alice and Team (the owner)? If you’ve already booked, go to Manage your holiday booking to view Alice and Team the owner's contact details or send them a message. Or send Alice and Team (the owner) an enquiry through the Contact the owner/manager form if you’d like a quote or more info first. When you pay online through the Book your stay form, a booking request is sent to Alice and Team (the owner). You’ll find out within 24 hours whether they’ve accepted - no money will leave your account before then. You can also request a quote from Alice and Team (the owner) through the contact form. The owner will email you the total cost for your dates and a link to book and pay online. Use the Book your stay form to pay provisionally online. You can pay by credit/debit card or PayPal. Alice and Team (the owner) will have 24 hours to accept the booking and no money will leave your account before then. Why can't I call Alice and Team (the owner) before booking? You’ll need to contact Alice and Team (the owner) to do this. Send them a message in Manage your holiday booking or through the contact form on this page. You can request to change the dates or number of people on your booking via the Manage your holiday booking page. To change your holiday dates use the Edit booking button. If you need to change the number of guests staying then send Alice and Team (the owner) a message. If Alice and Team (the owner) agrees, they’ll send you a revised quote outlining the changes. You can review and accept/decline this from the Manage your holiday booking page. You’ll have 48 hours to take action before the revised quote expires. Estimated price per night based on a weekly stay. Owner fees of £31.00 per stay may apply. Enter your dates to see the total cost.